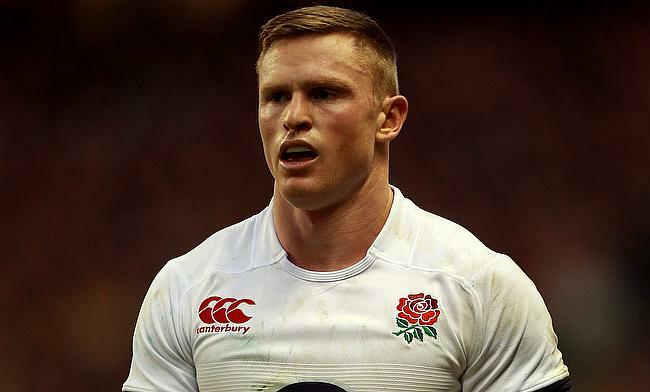 Sale Sharks winger Chris Ashton will make his first Six Nations start for England since 2013 after he was drafted in the starting line-up for the upcoming encounter against France to be played at Twickenham Stadium on Sunday. Ashton's inclusion means Jack Nowell, who started in the opening game against Ireland drops to the bench where he joins Dan Cole and Ben Moon. Meanwhile, Courtney Lawes gains a promotion from the bench to replace injured Maro Itoje in the second row while the Northampton Saints lock's on the bench has been taken by Wasps skipper Joe Launchbury. After the Ireland game we have had to refocus and reset. Players have been very good and certainly by Sunday we'll be at our best," said head coach Eddie Jones. "The French are always an interesting side to play against. They are full of talent, they have a lot of unpredictability so it's hard to prepare tactically against them so we have had a real focus on ourselves. "It is unfortunate Maro is injured but he has been rehabbing well so we are hopeful he will be back earlier than maybe first predicted. We have got great depth in the squad so Joe Launchbury and Courtney Lawes will fill his shoes very well. "We have gone for Chris Ashton on the wing; we think he might sneak us a try early in the game. Jack Nowell was brilliant against Ireland and he'll play a significant role for us off the bench. "We can't wait to play in front of our supporters, I'm sure they will be buoyant by the first round results and we promise we will play a better game on Sunday." England starting XV: Elliot Daly, Chris Ashton, Henry Slade, Manu Tuilagi, Jonny May, Owen Farrell (captain), Ben Youngs; Mako Vunipola, Jamie George, Kyle Sinckler; Courtney Lawes, George Kruis; Mark Wilson, Tom Curry, Billy Vunipola. Replacements: Luke Cowan-Dickie, Ben Moon, Dan Cole, Joe Launchbury, Nathan Hughes, Dan Robson, George Ford, Jack Nowell.